Since we had such a nice cooking set-up in our house, we cooked most of our meals in. We brought a lot of food from home and supplemented at the great gourmet shops, farms and seafood markets on the island. Close to our house was Souza’s Seafood for lobsters, Cowboys for meats and gourmet foods, and the Cellar for wine and cheeses. We visited Bartlett Farm during their summer solstice celebration when they had activities and tastings going on. 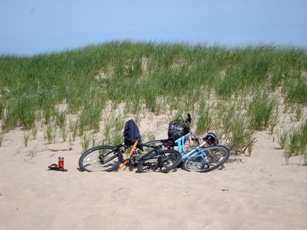 It’s a beautiful place to visit and stop for lunch on a bike ride. We also visited the Hydrangea Farm and the Pumpkin Pond Farm which is a real work of art! Nantucket is best appreciated for its natural beauty, and there are plenty of opportunities to get out and enjoy nature here. There’s no way you’ll miss the beaches, but there is a lot to see inland as well. There are several preserves with hiking trails where you will see wildflowers and wildlife. On the way out to ‘Sconset or Wauwinet is a preserve where you can ride bikes or horseback ride the many paths and reach one of Nantucket’s highest points, Altar Rock, measuring a whopping 108 feet above sea level. 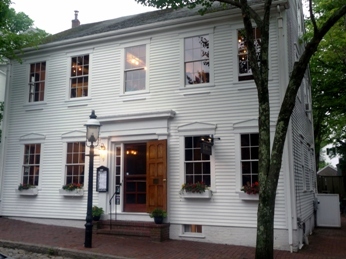 Nantucket has no shortage of great restaurants and we tried out 2 spots for dinner. First was American Seasons which was excellent! The menu is creative and the service perfect. We shared a scallop and crayfish appetizer and had entrees of tobacco rubbed duck and local Fluke. This and several other restaurants on island make a point of using as much produce as possible from island farms. On our last night we went to DeMarco for Italian. The restaurant is right in town and we had a nice table upstairs by the window, where we could watch the action on the street below. The pasta dishes were excellent and the tiramisu – out of this world. If you have a special occasion, there are caterers on island who will prepare a beach party for you. We saw a caterer setting up a stunning dinner for 8 on the beach right around sunset - incredible! A vacation in Nantucket is an opportunity to give in to total relaxation. The morning fog, the sea breeze, the rabbit peering at you from below a hydrangea bush – it’s all a chance to enjoy a slower pace. Take the time to walk the cobblestone streets where each home is picture perfect draped in climbing roses. There are several museums and historic sites for history buffs and plenty of boating opportunities for water enthusiasts. Nantucket’s best activity is bike riding – the island is paved in perfect bike trails crisscrossing the island, giving visitors the opportunity to leave their cars (and their fuel budgets) behind. It’s an ideal vacation destination for families of all ages, couples, or groups of friends meeting up. The next time you are looking for a classic American vacation catch a flight, board a ferry or tell Jeeves to fuel up the yacht – The Grey Lady awaits.